On October 8, 2016, Antiquroum will hold their “Important Modern & Vintage Timepieces” auction, signalling the start of the fall/winter watch auction season. Among the lots of ultra-luxurious and rare timepieces are three vintage Rolex Daytona chronographs that will certainly fetch eyebrow-raising prices. Let’s take a closer look. It’s estimated that the vintage Rolex ref. 6240 was produced from 1965 until 1969. It was the first Rolex Cosmograph to include the screw-down pushers, thus, the first true waterproof “Oyster” Cosmograph. The Rolex ref. 6240 chronographs have received even more attention recently thanks to the “Solo” dials found on some models. Named so because those particular dials only have “ROLEX” printed on them, without any other text, Solo dials are highly sought after in today’s vintage Rolex market. These are popular models when searching for Rolex watches for sale. This particular ref. 6240 is not a Solo dial, but rather, it also includes “COSMOGRAPH” text on the dial. Nevertheless, it’s still a part of the rare and coveted ref. 6240 family of watches. This particular example was first sold in 1968. It features a silver dial with the trio of black registers, characteristic black bezel, and stainless steel jubilee dial. Within its stainless steel 37mm case lies the manual wound Valjoux 722 caliber. The production of the Rolex Daytona ref. 6265 ran from about 1971 until 1988 and it was available in both steel and gold. The gold versions of the ref. 6265 was the first Daytona to feature the “Superlative Chronometer Officially Certified” on the dials due to the Valjoux 727 within. The ref. 6265 watches (along with the ref. 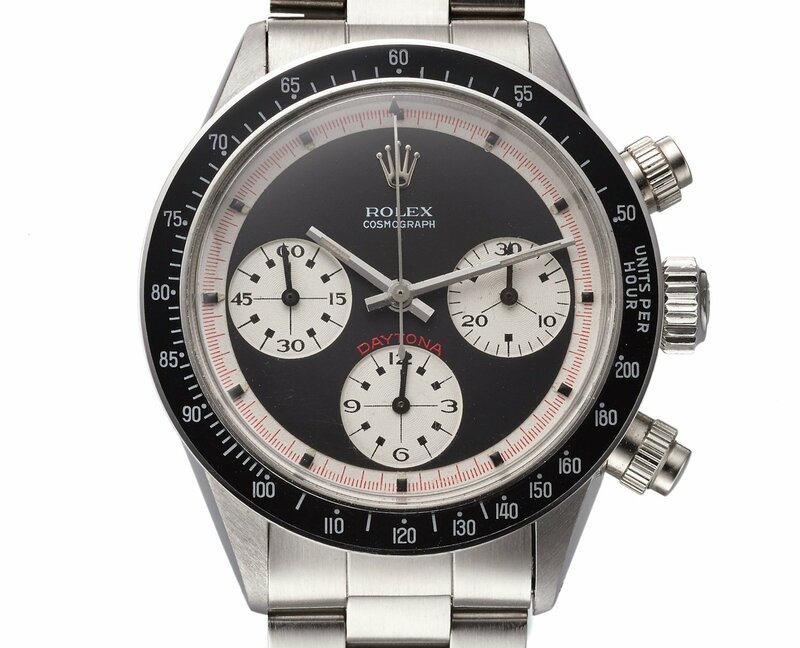 6263) were the last Daytona chronographs with a manual mechanical movement. This particular ref. 6265 in yellow gold dates from 1979. 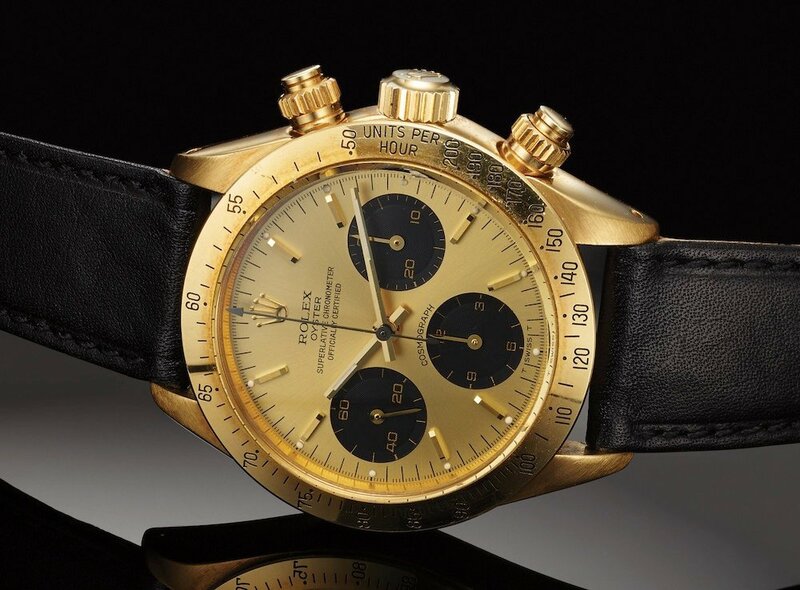 It sports a champagne dial, three black subsidiary dials, and a yellow gold bezel with the tachymeter scale. Rather than a metal bracelet, this ref. 6265 is on a black leather strap with a Rolex buckle. Not only is this particular Rolex a vintage Daytona 6240 (already discussed above), but it also dons the Paul Newman dial. That combination makes this watch a very rare occurrence, and thus, highly coveted. 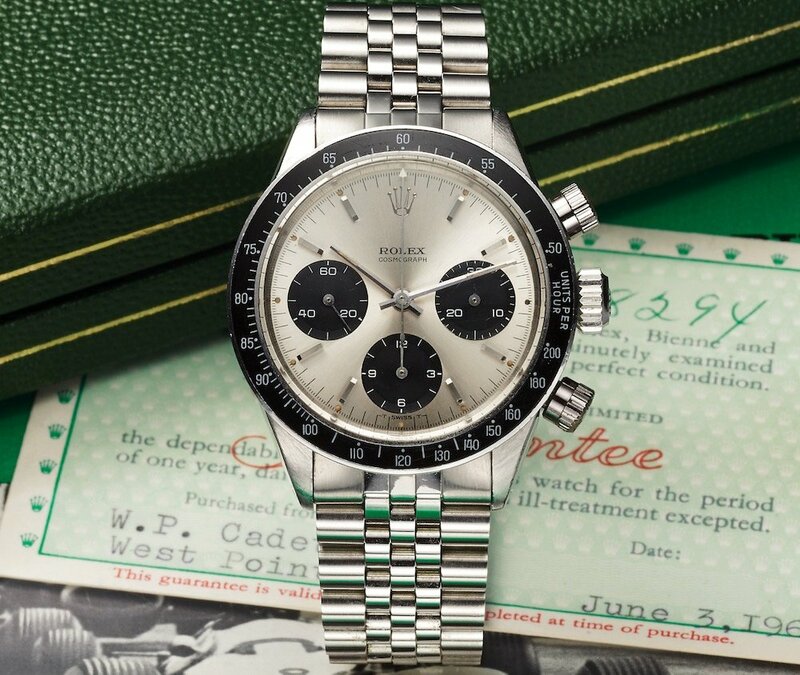 Circa 1967, this is one vintage Rolex Daytona not to miss. Furthermore, this Paul Newman dial is the tri-color black, white, and red variety, which most Rolex collectors agree is the correct one for this reference. Additionally, the red “DAYTONA” label is clearly seen above the sub-dial at 6 o’clock. Since this Paul Newman Rolex is a ref 6240, it boasts the screw-down pushers and black bezel. Vintage Daytona chronographs are some of the most in demand among Rolex collectors, and thus, we suspect that these three fine examples will do well at the Antiquorum auction.